This is the “New improved” version of the Mini Co2 Regulator Charger. Following a number of failures of the original units the manufacturer has redesigned it completely, this is a much more substantial device. Also note the gauge scale is now graduated to 30psi FSD. 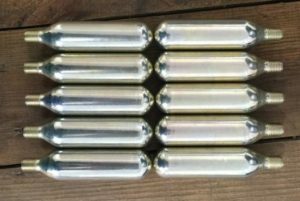 The Co2 charger uses the 16g threaded Co2 bulbs and is machined form aluminium. 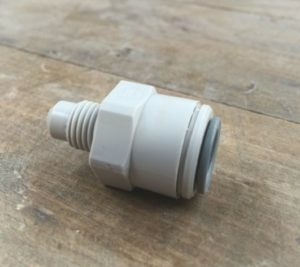 Although very compact it houses a regulator so once the Co2 bulb has been screwed in it can be turned off or set to the desired pressure. This allows the user to purge and force carbonate and dispense their beverage. Simple screw onto the 1/4″ thread of the growler dispense unit. What really sets this apart is it will fit a standard gas ( or liquid ) disconnect. This allows mobile dispense form a AEB/corny/Sankey keg. 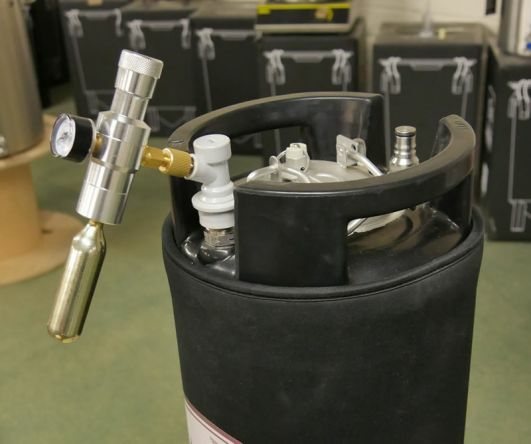 Using a 9l AEB keg we have found that one bulb will dispense 7 litres making it economical to use for serving at a party. This regulator can also be used with a JOHN GUEST 3/8 TO 1/4 FITTING. This removes the need to use a disconnect so the regulator can be used as a very portable Sankey keg dispenser.